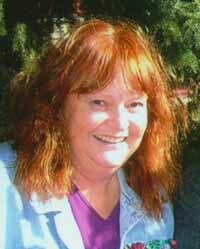 Rusty Marti passed away in her home in Ketchum, Idaho, on April 18, 2011. Karen Elizabeth Winthrop (Belger) Marti was born Jan. 6, 1954, in New York City. She was raised in Connecticut by her mother, Anne, and stepfather, Gilbert, and was adored by her little sister, Krissy. During her childhood, Rusty excelled in competitive swimming, where she reigned as undefeated champion during a 10-year career. She also enjoyed Western riding, a fondness that she acquired after receiving an Appaloosa horse as a gift from her stepfather. Rusty attended Bennett College in upstate New York, obtaining an associate's degree in art and photography. She also enjoyed acting in the school theater productions. After college she worked in Poughkeepsie, N.Y., as a photographer and eventually made her way west to Portland, Ore., where she lived for several years and touched many lives of both the two- and four-legged persuasions. There she enjoyed camping and cross-country and alpine skiing, and became an accomplished sailor. After a short stint back East, Rusty moved to Sun Valley in 1998, where her passion for the outdoors and animals was reignited. Although her health had started to deteriorate, she persevered with a sunny disposition, often putting her doctors and medical attendants at ease with her jokes and sarcastic sense of humor. Rusty loved life, travel, snorkeling, people, good food, friends and, most of all, her canine friends. Her favorite sleepover companion was a blond lab, Anna Banana. Rusty had a special gift for talking with the dogs, and, of course, they would talk back. Surely Sophie, Lily, Remy, Chrissy, Rosie, Annie, Snickers and all the others confided in Rusty about the inadequacies of their masters in comparison to her. Rusty is survived by her mother, Ann M. Rogers; her sister and brother-in-law, Krissy and Larry Segal; and the loves of her life, her nephew and niece, Josh and Lydia Segal, all of Connecticut. She was preceded in death by her stepfather, Gilbert W. Rogers; her biological father, William Belger, M.D. ; Sweetie Pie, her golden retriever; and all her other four-legged "children." She will be missed dearly by her family and friends, but most dearly by the dogs who adored her. Rusty surely is in "doggie heaven" somewhere over the Rainbow Bridge, gossiping and tumbling in the grass with her beloved Sweetie Pie and all her other four-legged best friends. A memorial service will be held Thursday, April 28, at 5:30 p.m. in the Ketchum Rotary Park. Dogs are encouraged to bring their masters, on a leash, of course. Donations in her memory may be made to the Animal Shelter of the Wood River Valley, Box 1496, Hailey, ID 83333, or the American Heart Association, Memorial Donations, Box 6000, San Francisco, CA 94160. Tributes and condolences may be left on the Wood River Chapel website, www.woodriverchapel.com.